The objective of the arrangement is to manipulate the material by cutting, bending and removing unnecessary parts until nothing more can be removed. The ultimate aim is to emphasize the beauty and power of what remains. Though some might have cut more aggressively, I chose to retain seven side branches to balance the strong container and to provide depth in the arrangement. Branches which point to the rear and the front often aren’t clear in two dimensional photographs. 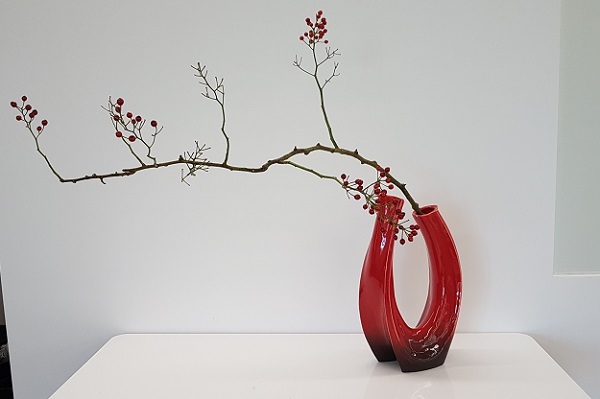 I particularly liked the way the dark brown stem and waxy red berries echoed the two colour tones in the glass container. Though I often choose to enjoy my large meal at lunch (because a large meal mid-day is about half the price for the same standard of food and service), every day, no matter where I am, I face the question of finding dinner. When making food choices I mix up high and low. I’m no food snob. I’ve cooked chicken organs with cabbage hotpot style in a subterranean Tokyo room for a few hundred yen, and occasionally when others have arranged it enjoyed Michelin stars. Of course, I frequently return to favourite places where I am most warmly welcomed. 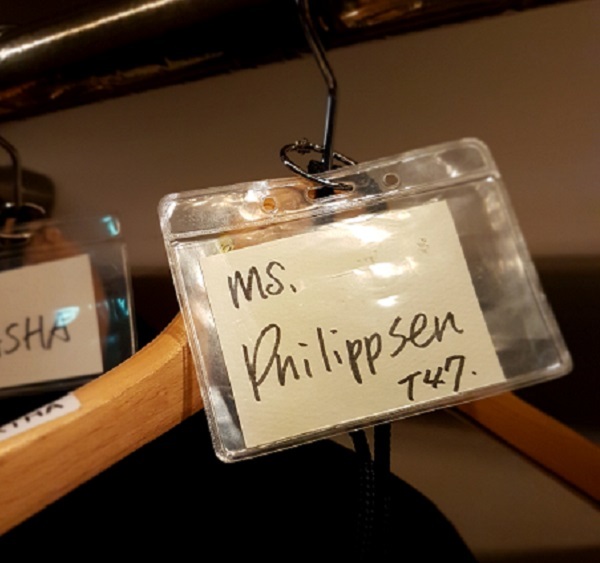 To my surprise, Two Rooms kept my name tag for my coat from last year. How sweet is that? However, repeatedly I face the daunting prospect of navigating a Japanese menu with Google Translate and a great deal of uncertainty as to what exactly will arrive at the table. While I have rarely been disappointed, sometimes I have been surprised–squid guts as an appetizer comes to mind. Whenever possible I like sampling local specialties. 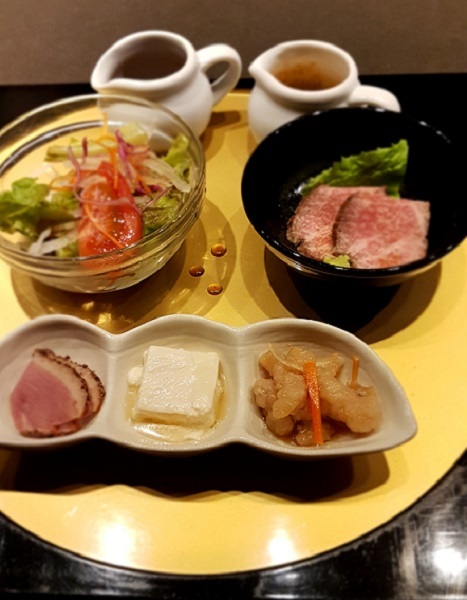 Therefore, the other weekend when I landed in Yonezawa I definitely wanted to enjoy their call to fame: Yonezawa beef. During a stroll back from the river park where I’d gone to stretch my legs after long ride from Tokyo, quite near my hotel I found Bekoya. 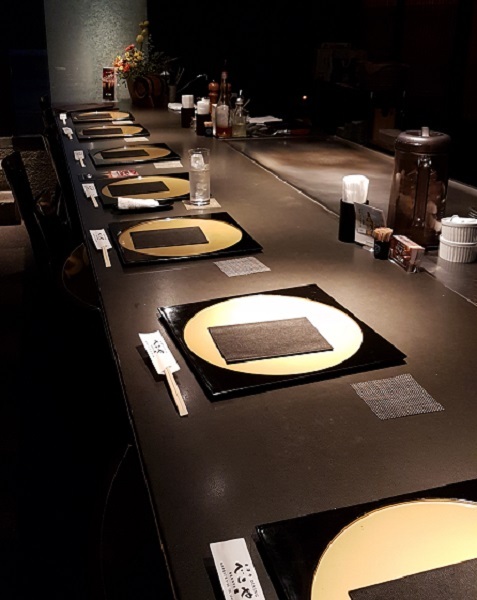 The restaurant offers a number of dining options and I chose to have steak grilled for me over yakiniku, shabu shabu or sukiyaki which are better enjoyed in groups. I was led into a restfully dark room, brought a warm hand towel and given a menu. 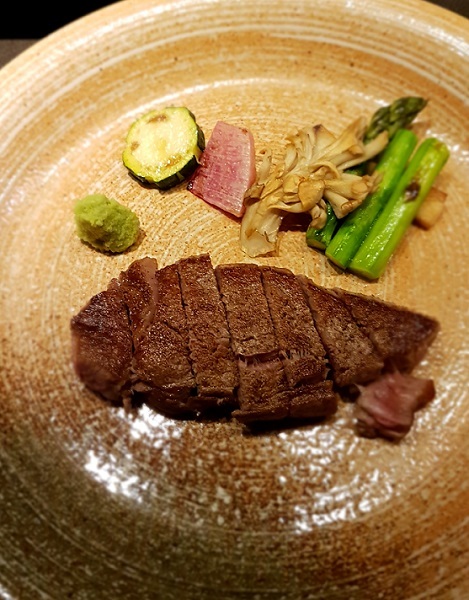 Between the picture-menu, a little English and a little Japanese I requested the dinner set: 100 grams of Yonezawa beef done rare. The set included appetizers: salad, a slice of ham, slices of beef, and a special local tofu. 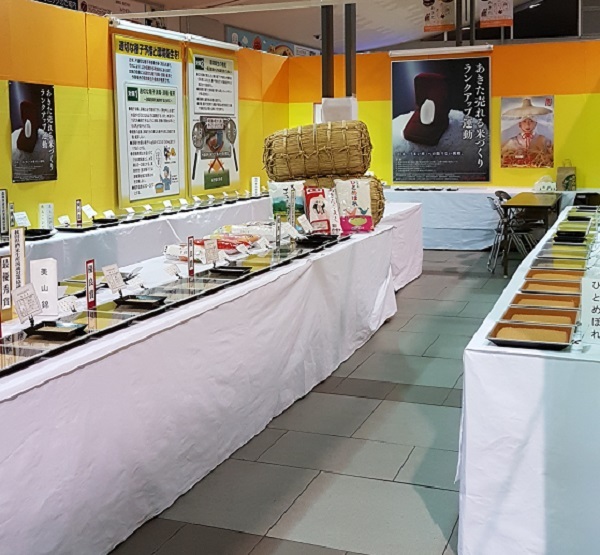 In addition to the beef, the meal featured the newly harvested, regional Tsuyahime rice, a choice of vegetables, two desserts and tea. 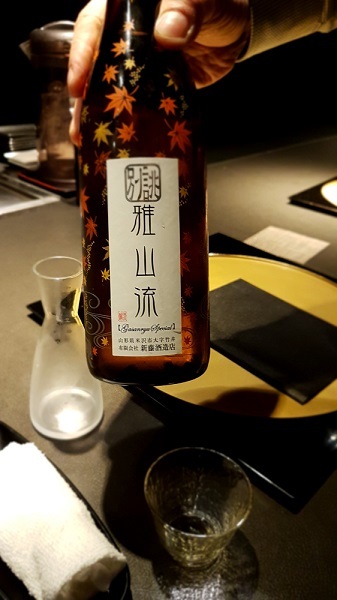 When I indicated that I’d like to sample Nihonshu for which the area is also renowned, the waiter suggested a regional sake only available in the autumn. 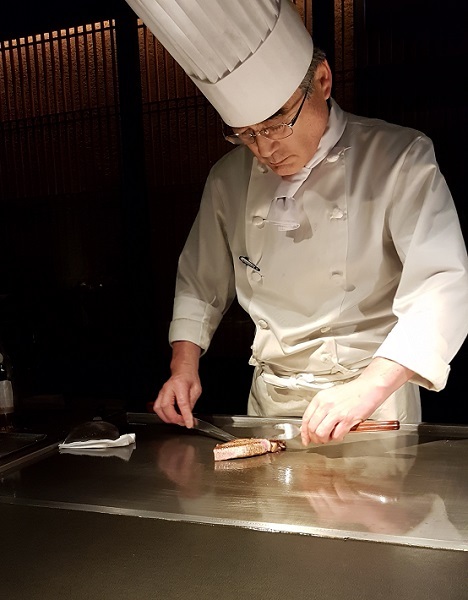 While I enjoyed the appetizers and the wine, Chef Ito prepared the vegetables and meat which he finished in a flambé. 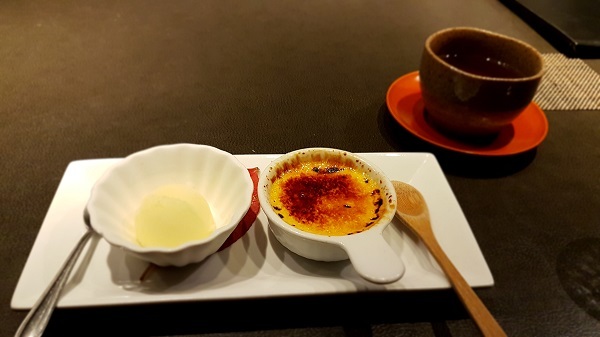 The double-header dessert included a crème brulee along with apple granita. Yonezawa apples are famous throughout Japan, and that simple confection I’d most definitely like to have twice. There’s nothing that quite matches being led to the table to be fed. Bite for bite, food–especially fresh, seasonal, local food–not only nourishes but also delights and consoles. The tea was hot and slightly bitter. I leaned back most pleasantly stuffed. Sweet. 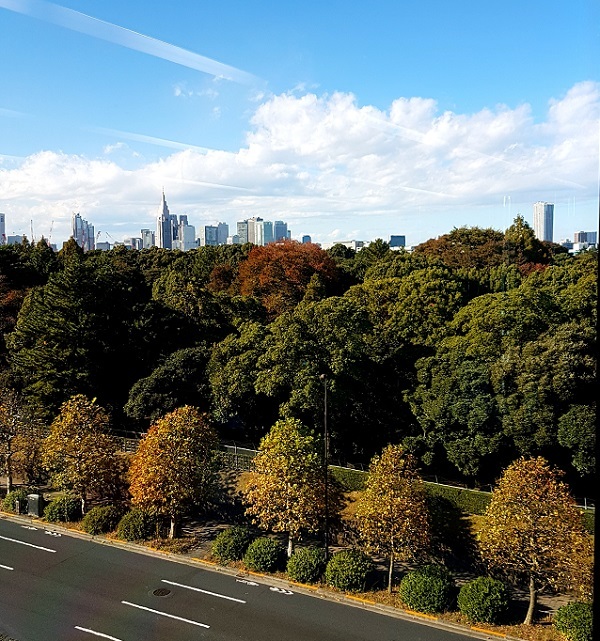 During my recent two-week recess from classes, extensive travels followed by technical difficulties with WiFi connection and balky computer performance, I continued to enjoy the pleasures of Tokyo’s various wards. 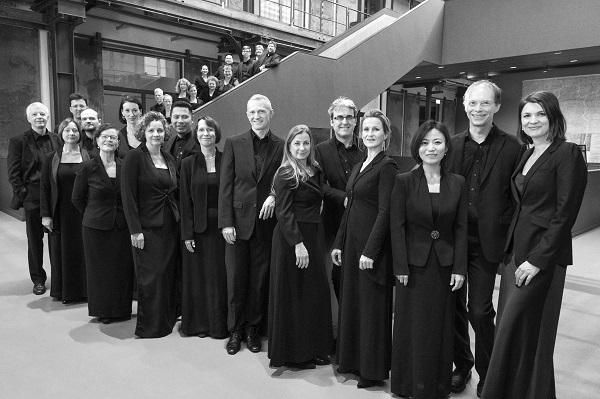 In early November as part of a five-concert tour of Tokyo, Kanazawa and Osaka, the Rias Kammerchor Berlin performed in the Tokyo Opera City Concert Hall. Its impressive pyramidal ceiling, technological innovation and oak mantled interior create idyllic acoustic conditions. 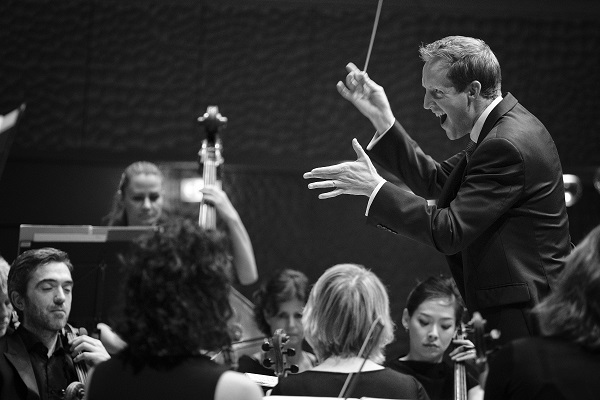 Trevor Cox, author, broadcaster, researcher and teaching Professor of Acoustic Engineering has ranked it among the world’s best ten concert halls. I chanced on one of two remaining seats on the far left of the front row of the lower orchestra when I learned the choir would be in the city. Normally I’d move back (even into the balconies) for a better listening experience; however, in this hall I was assured there were no bad seats. That fluke gave me wonderful proximity to the singers as well as a profile view of conductor Justin Doyle whose fluid energy and subtle gestures enhanced the performance enormously. The familiar repertoire of various Bach and Bruckner Motets as well as Mendelssohn’s Drei Psalmen Opus 78 was performed in German and Latin. Sweet relief! I could enjoy the glorious evening without having to navigate language issues and communication problems. The gorgeous a cappella sound was powerful and brilliant when called for, gentle and pulled back when not. It brought me home, not to a geographical or physical place, but to the soundscape which I recognize as embedded in my DNA. For some their home is soul. For others it’s Gospel or blues or folk or rock or hip hop or any one of numerous musical genres. Mine is in the classical a cappella choral tradition. Rias Kammerchor Berlin can be found on YouTube and Spotify. For anyone with off-key, pre-Christmas jingle fatigue (already going strong here in Tokyo), there are magnificent alternatives from this group. Used with permission. Black & White Photos © Matthias Heyde from the RKC Press Files. 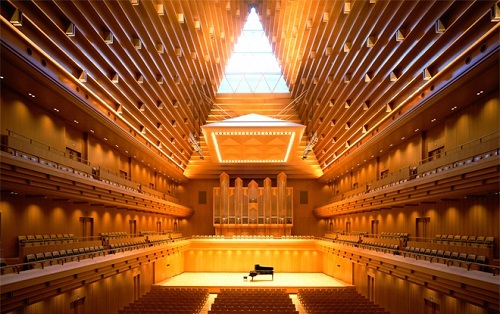 Tokyo Opera City Concert Hall photo from TOCCH Website. Sometimes an idea calls me. When it does, I like to say yes. The day after visiting Atami I used my JR East Rail Pass to visit Akita City. 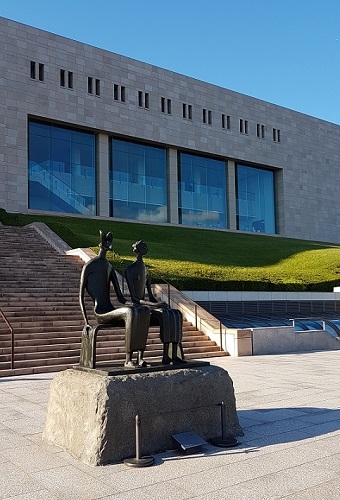 It is home to the Akita Museum of Fine Art: Hirano Masakichi Museum of Fine Art built by architect Ando Tadao as well as the Akita Senshu Museum of Art. 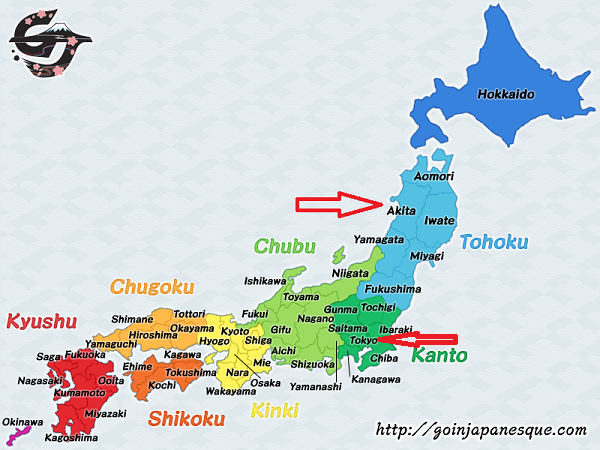 Ordinarily, I wouldn’t choose to hit the northern regions of Japan in a single day. I’d prefer a leisurely journey with time to savour the local atmosphere and discover off the beaten track surprises. Even when presented with the unexpected option to cash in about $400 worth of free train fare, some might think a 14-hour day to see two galleries a touch insane. However by seizing the serendipitous opportunity, I experienced incomparable, time-limited exhibits and stunning architecture which I may never have a second opportunity to view in my lifetime. Then during the long haul in the dark from Akita back to Tokyo, I had four hours to shape my scribbled notes from the adventures in Yonezawa, Atami and Akita into rough drafts. According to the very limited information available in English, after numerous trips to Akita to gather information, Foujita created the work 1937 using oil. 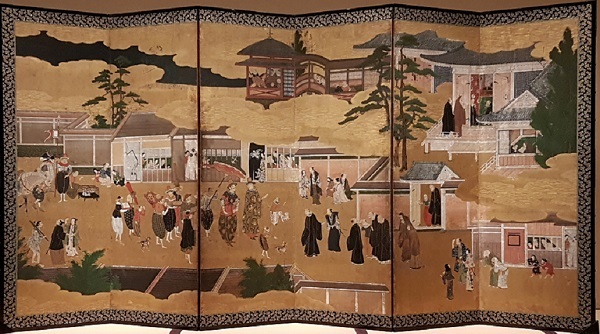 The panels depict seasonal events in Tomachi, a merchant district in Akita City. The vibrantly coloured scenes depict various seasonal festivals at local shrines as well social life and commerce in the town’s winter landscape. Celebration, prayer, entertainment and livelihood, stand alongside oil derricks, bags of rice, lumber and a sake barrel—Akita’s primary industries. A symbolic rendering of Korogibashi Bridge near the site of the ancient Akita Castle separates the festive from the mundane scenes, and alludes to Akita’s long history. There is a ban on photography at the museum. A few clandestine online shots fail to reveal the work to the standard that it deserves. Reduced to a few pixels it’s hard to imagine it towering above you with any sort of power and grandeur. However, for anyone dying for a look, I found a link to a copyrighted image on the Masakichi Hirano Art Foundation website (which I will assume lends it some legitimacy). 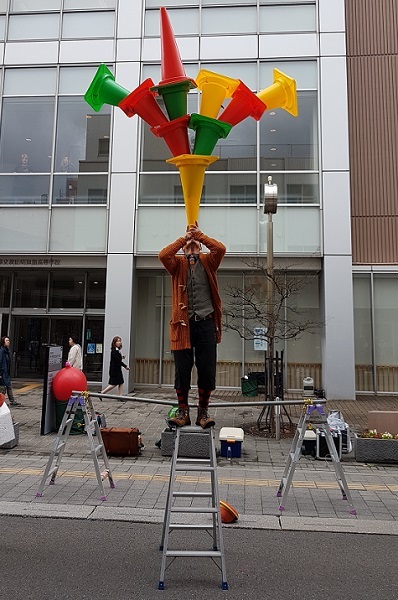 Though I was somewhat disappointed not to be able to share images of this massive and captivating work, I was delighted to find the “Events of Akita” still thriving on the street. Approaching the museum from the station it was Akita’s centuries-old business as usual. Along the promenade from Akita Station the association for Creative Farmers’ Action held its annual week-long festival promoting local produce and merchandise. Shop owners called irashaimase from their doorways. Packs of school kids hung about. Mothers urged their children along. Housewives carried on with their shopping while street artists performed. Though it was closed for the day when I got to it, an extensive display featured numerous samples of local rice. The poster on the end wall featured a single grain as if it were a fine jewel (which indeed it is). Though few outside Japan may remember this point in their history lessons, Japan’s currency (its equivalent of the gold standard) was once measured and paid not in coin but in rice. Alas, due to blustery winds this poor fellow kept having his pylons blown off before he could climb to the top rung, balance them to his chin, and then his head. However, to the delight of the spectators after many disappointing starts he persevered long enough to succeed. All clowning aside, perhaps an apposite reminder for us all. 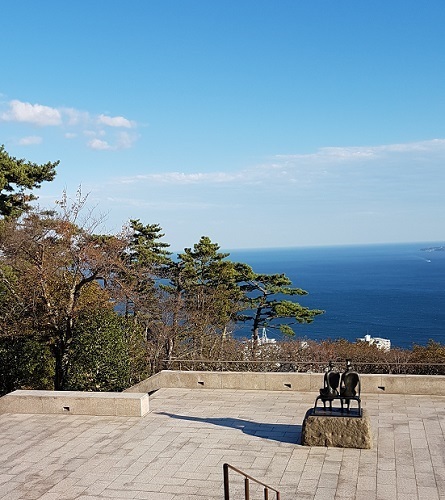 Described as a museum which holds distinctive exhibitions of outstanding works renowned worldwide as well as from within Japan, a number of artists exhibited here have connections to Akita. There is also a memorial gallery for Okada Kenzo who is well-regarded abroad. 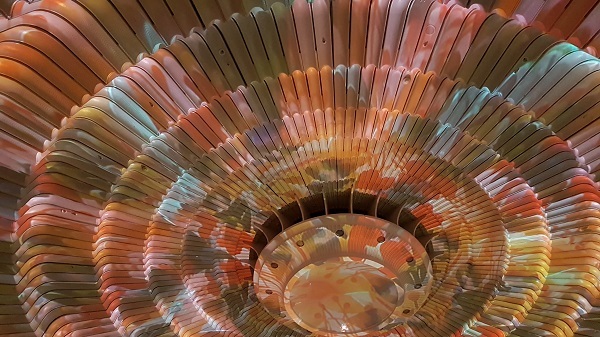 Though I had no idea of the marvel I was about to view, the main exhibit during my visit featured the large-scale works of Senju Hiroshi an artist who works using traditional Japanese methods and materials in original ways. Again, most of the halls in this exhibit do not permit photos. Just as well. 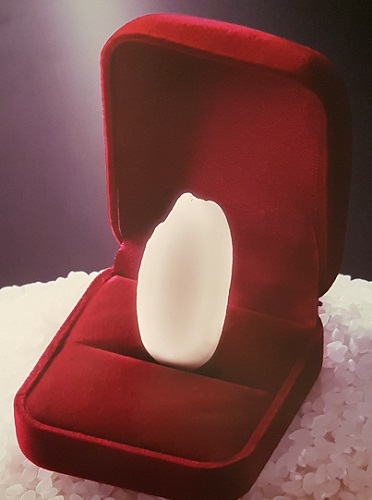 Amateur shots of exhibition items rarely qualify as splendid things. 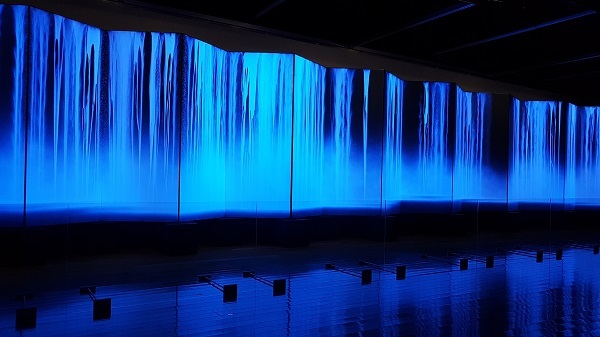 However, for the one room which does permit photography, the mesmerizing way that alternating black and white lighting plays over special paints used in Senju Hiroshi’s Day Falls/Night Falls” painting might provide a glimpse of the glory that imbues these works. Words fail the impact of Senju’s screen and wall paintings of cliffs and waterfalls commissioned from him for Kongobuji Temple at Koyosan, a sacred Buddhist site. 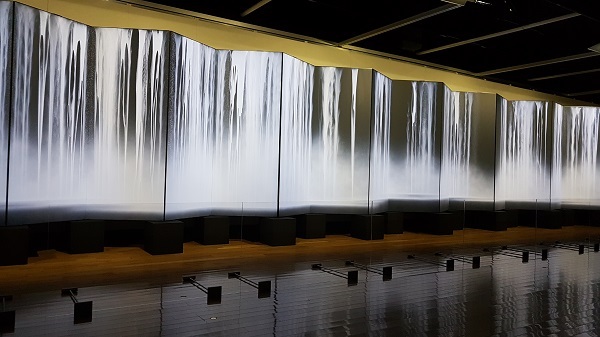 Though nothing can touch the scale of the works in a darkened room, numerous compelling images of his waterfall and cliff paintings as well as other works can be found online. Fortunately, there is more English exposition throughout this exhibit. I am particularly struck by the details of Senju’s transcendence practice and his shaman-like ability to open to altered states of perception. His works carry the power of those states of ecstasy and Senju’s deeply spiritual experience of beauty. As such they are incredibly moving. 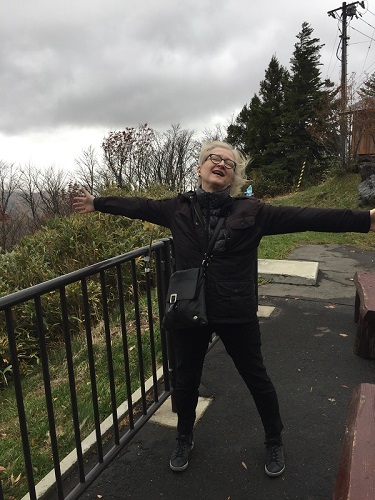 Yes, after five days of back to back travel and numerous shattering wonders to behold, my brief moment in Akita meant a long ride for a brief experience. Still its intensity was such that it’s one I won’t forget or regret. Apologies, folks. An unedited photo slipped into the blog post full-sized and messed up the subscriber’s version. Click here to read the post from the website. When I bought the Shinkansen tickets to visit my friend in Yonezawa, the ticket agent informed me that it would be cheaper to buy a JR East Rail Pass. 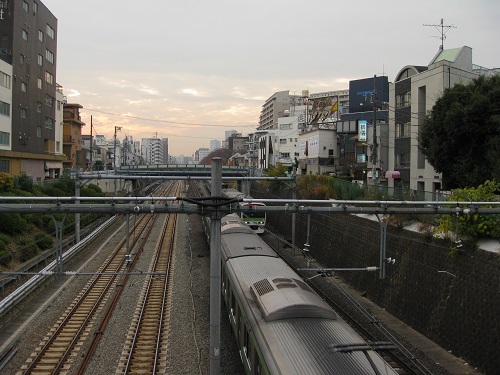 A pass would allow me five unlimited trips in a seven-day period to any destination in the JR East system. Fortunately, due to a major exhibition at Sogetsu Kaikan, some of my ikebana classes had been cancelled. I had time to use a pass during the limited window offered. Win-win. 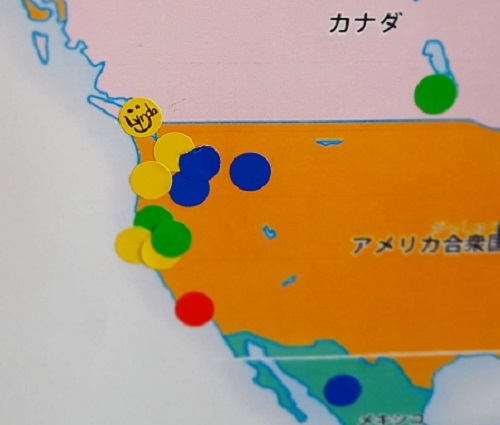 Where in JR East’s world did I want to go? It was not an easy choice. However, I’d been missing the ocean. 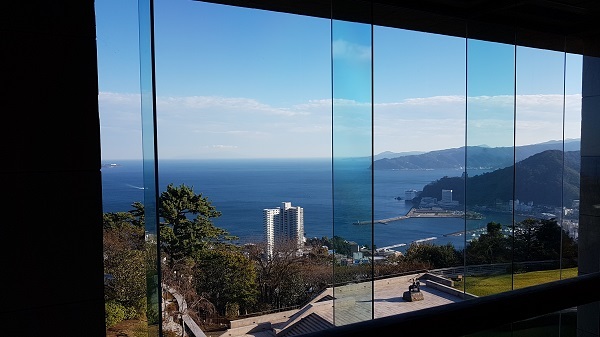 Therefore, my first excursion was to Atami, a seaside town about 90 minutes south of Tokyo by Express train, which is home to the splendid MOA Museum of Art set into the hillside overlooking the sea. Unfortunately, the shorter 40-minute Shinkansen option to Atami was not included in the Pass. However, the $50 (return) price-tag on the Express for a one-gallery destination when it included the seaside seemed an agreeable way to capitalize on a free ride. Built into a hillside with incredible vistas of the sea, on entry visitors ascend on escalators flanking massive stone stairways. I am reminded of approaches to shrines, temples and holy sites which often require the pilgrim look heavenward or to climb toward the gods. 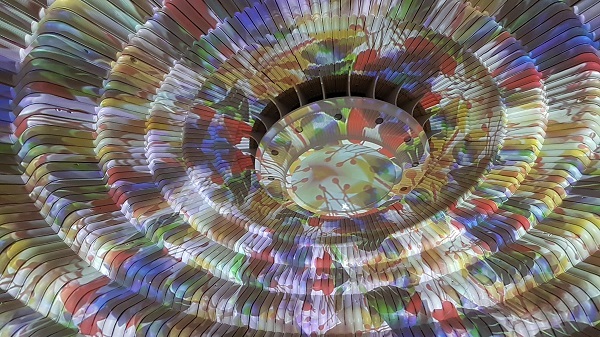 At the top, light projections move across a massive sculpture resembling a chrysanthemum, the Imperial flower of Japan. The symbolism–equating the treasures here with holy relics–seems obvious. 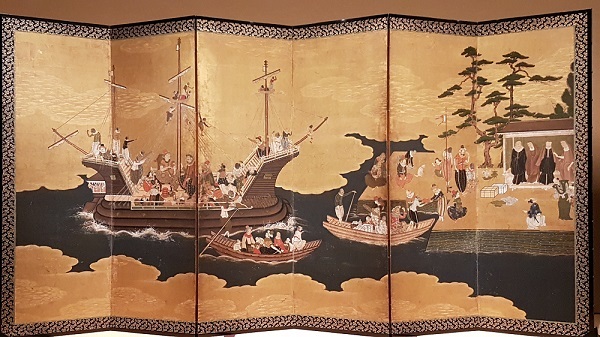 The MOA is of particular significance as it houses collections of works designated as National Treasures, Important Cultural Properties and Important Art Objects in widely ranging forms: paintings, ceramics, calligraphy and the like. According to the English language brochure these are not only works of art, but also objects of research without which the history of the art form itself could not be told. 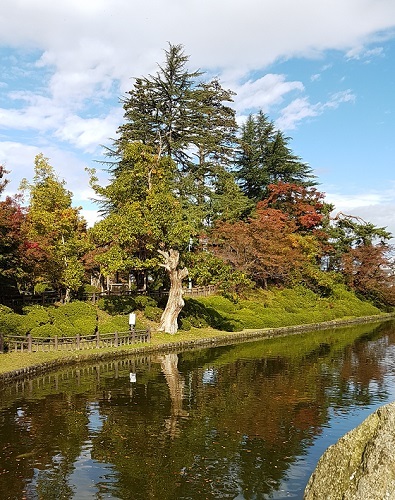 In addition, the museum grounds include a tea houses in a Japanese garden and a Noh theatre. Alas, that created challenges in getting photographs. However, amateur shots of great art are not meant for online display. I use them mainly as notes and reminders of what I have seen. However, a 17th century world map and scenes of commerce with European traders on large screens in brighter rooms turned out rather well. As the excursion was one I could schedule after ikebana class on Monday morning, I’m ever grateful that I did. Both the architecture of the museum and the exhibits were worth the travel time spent. 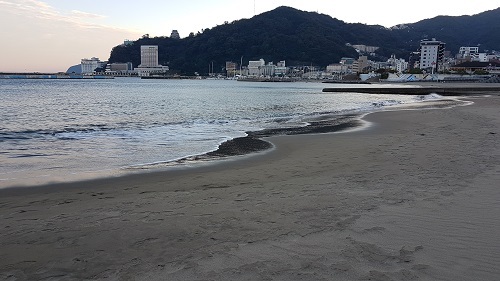 Afterwards I wandered on the beach lined with palm trees as the sun set behind the Atami hills. 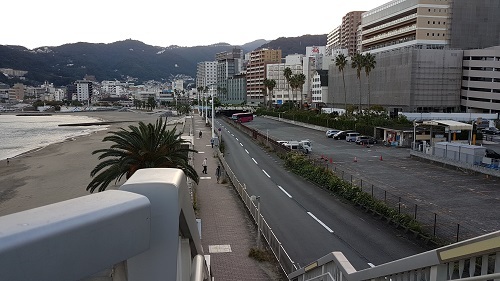 Then before returning to Tokyo I looked for some light fare at a restaurant with a harbour view which the taxi dispatcher had suggested to the driver. From the picture menu provided and the price point (compared to Tokyo) I was expecting a small sampling of fried local fish and cabbage. I also asked for a glass of wine. Oops! 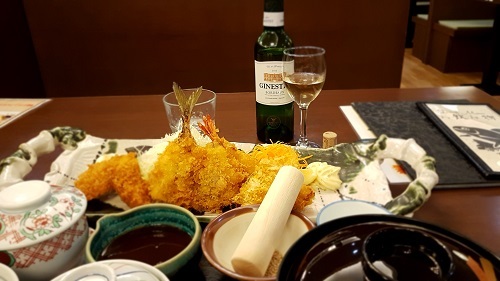 In addition to the selection of fried fish, shrimp and pork, the heaping tray included a large bowl of new rice, chawan mushi, salad, a mixed vegetable appetizer, Japanese pickles and crab miso soup. That arrived together with a half-bottle of French wine. What was I to do? There are only two answers for that. One: Shoganai (nothing can be done). Two: Enjoy. Cloud streaks caught the setting sun and bathed the valley in soft light as I disembarked from the Shinkansen at Yonezawa Station on a late October Friday afternoon. The crisp air was faintly redolent with smoke–like incense–as farmers had burned the rice stubble from their fields earlier that day. 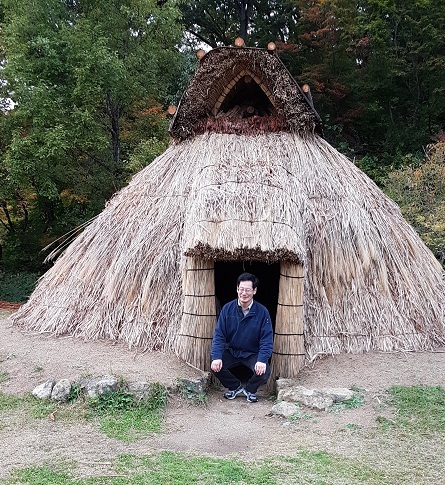 I had arrived in Japan’s countryside or satoyama with its own distinctive nature and culture. 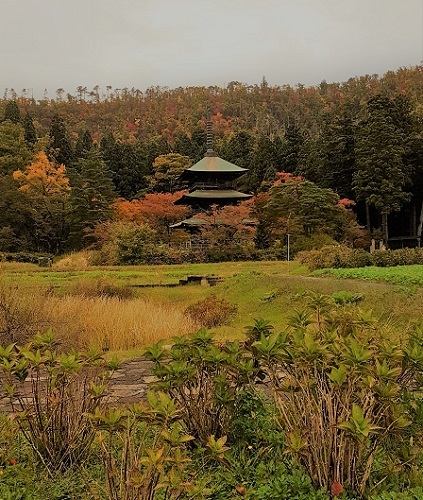 Though southerly Tokyo was still green and had finally started to cool off in proper autumnal fashion, in Yamagata prefecture’s mountains koyo (autumn leaf viewing) season was already in full swing. Some places were said to have already peaked. When I lived in Tokyo last winter my friend Derrick who now lives and works in Yonezawa encouraged me to visit; however, I did not have the requisite clothing for an area that essentially becomes a freezer during the winter. Snows to the second storey. Roads of solid ice. That sort of thing. But during the last week of October Sogetsu Kaikan had cancelled my classes for a major exhibition giving me a window of time to head north. On Saturday morning Derrick picked me up from my hotel and we embarked on an adventure through Yonezawa and outlying areas. 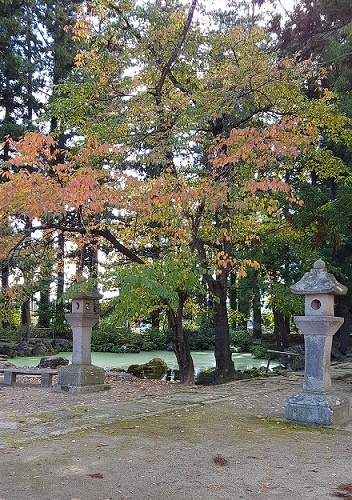 Before departing by car we walk through the nearby Uesugi Shrine gardens in the morning sunshine. Then we hop into the car for Tengendai-kogeni a a popular hill for skiers and snowboarders in the winter months. There we take a gondola up the mountainside. 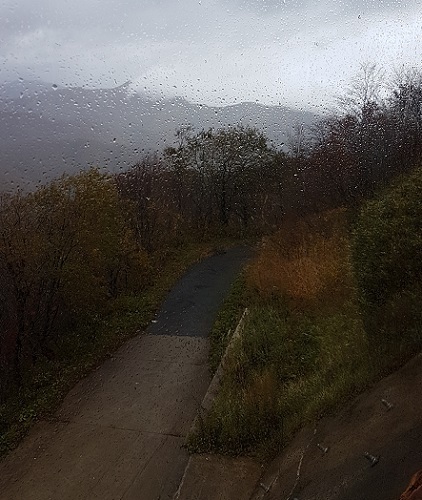 The brilliant foliage covering the mountain hillsides, beyond superlatives or anything a phone camera can render, seems to float past as we ascend. At the top we step outside for a look around, but a fierce wind nearly blows us over. Moments later we are hit by hard rain. The hillside was golden. Now it’s gone, shrouded in dense mist. 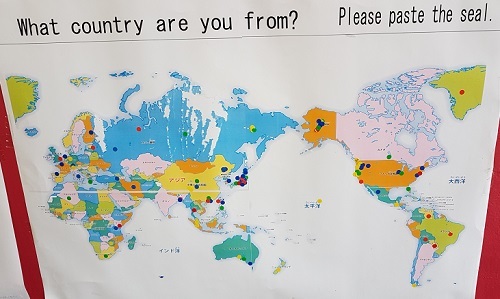 Visitors are invited to place a sticker on a world map. The second Canadian to visit and the only one from Vancouver Island, I embellish mine a little. 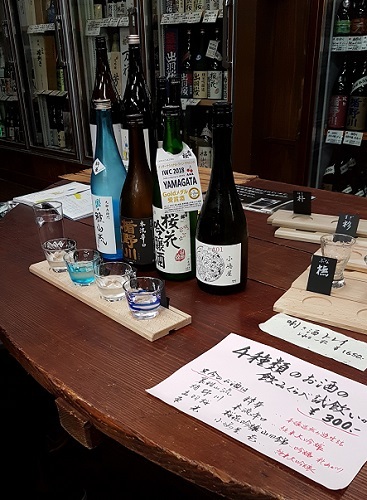 On the way back we pause at Kamoshika a Nihonshu (sake) purveyor’s shop where I sample several local varieties. Derrick is driving and cannot partake as Japan has 0% tolerance for alcohol consumption for drivers. So I buy him a bottle of the one I like best. 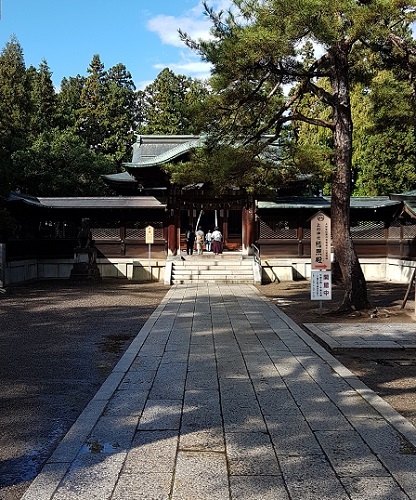 Then we are off to Kameoka Monju, a mountain temple where students pray for success in exams. I don’t normally pray in these situations, but this time I ask for the right spirit and success in my ikebana studies. Who knows who might be listening and feeling magnanimous when it comes to the gods? 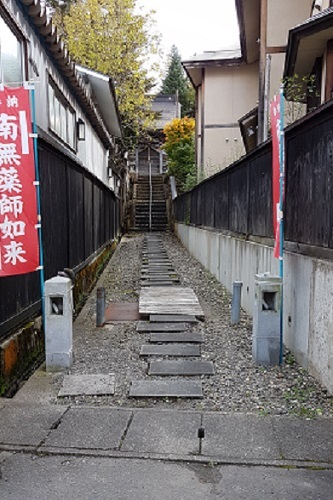 After pausing for a tasty soba lunch at Konaya back in Yonezawa we carry on to Mahoroba Inishie-no-Sato Historical Park in neighbouring Takahata city. 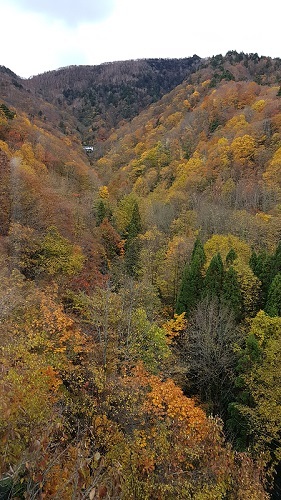 Nestled against the hills is a small pagoda, part of Akutsu Hachiman Jinja (a shrine). 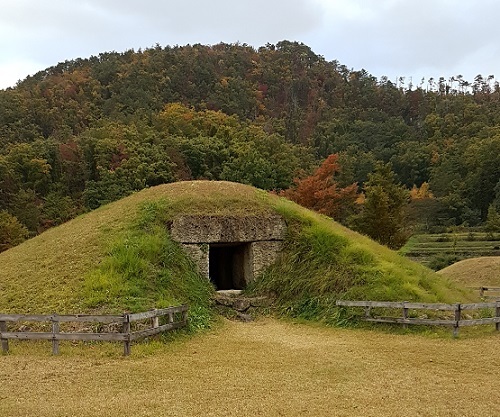 Nearby, two Jomon period huts and a koruna (burial mound), reconstructions on the original site, allow us a glimpse into the lives of prehistoric peoples living in that area of Japan. Sunday morning after a brief stop at Starbucks (as no indie shops were open at 9:30 AM) we drive over to Fukutoku Bishamonten a small, 1200 year-old temple with a lovely rustic garden. 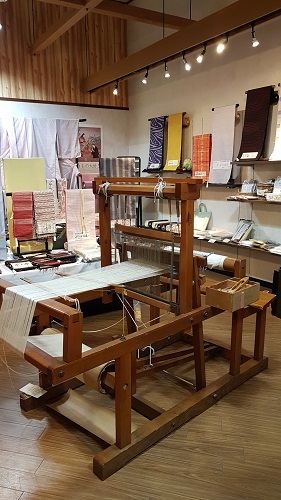 Then we are off to Yoneori Kaikan, the Yonezawa Textiles Association Hall (which is not to be confused with the separate Yonezawa Historical Textiles Museum). Yoneori Kaikan is still operating. Alas, who knows for how long? 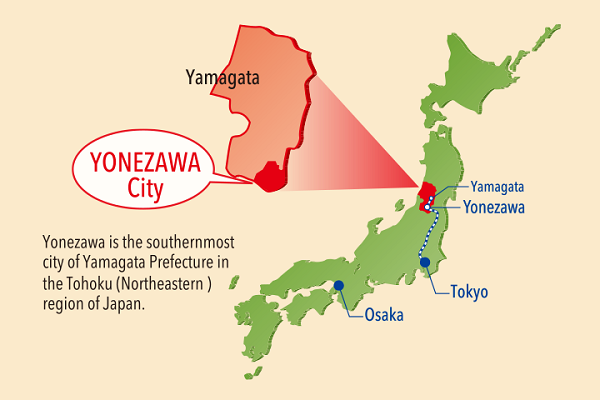 Yonezawa was once renowned for its silk industry. 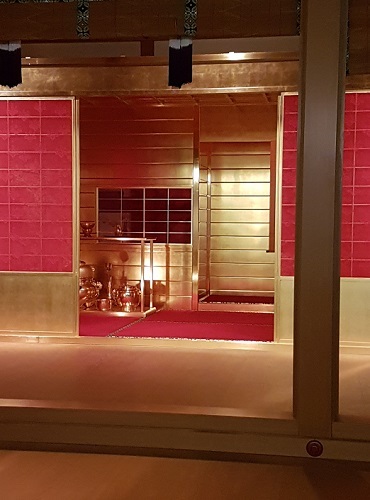 However, the decline in demand for high quality fabrics and fewer people wearing kimono has forced many establishments to close over the years. 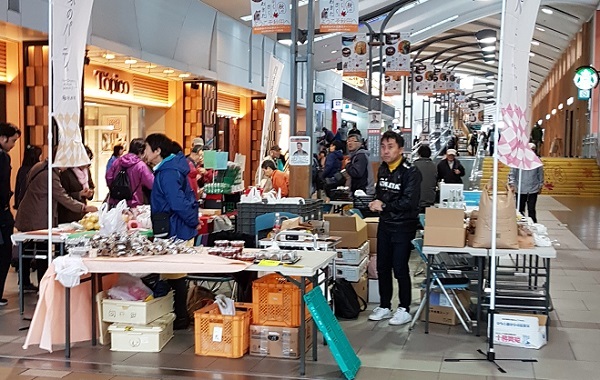 Others hang on trying to reinvent themselves to suit the times, offering a variety of small items they hope will appeal to the tourist trade. What to do when the prestigious work for which you and generations before you have devoted a lifetime honing skills and artistic vision no longer has commercial or other value? Carry on under a cloud of despair knowing that it dies with you? Difficult questions with more than difficult answers. 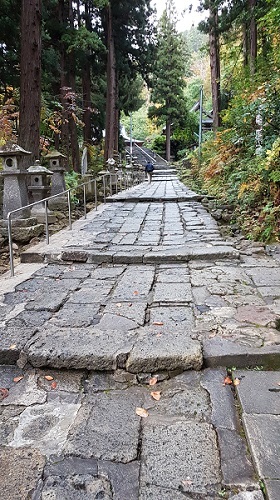 Then it is off to Onogawa, a mountain onsen (hot springs) town up winding roads lined with newly harvested rice fields, small apple orchards, heavily laden persimmon trees, and kitchen gardens nestled into the red and gold hills. We don’t bathe but wander around through shops and buy a few things before heading back to the city for lunch. All too soon it is time for my train and speedy, grateful goodbyes to my thoughtful, generous friend who planned a comprehensive view of his city and surrounding areas for me, and invited me to join his friends for Halloween revelry. Trains have a way of inducing a hypnotic state. On the crowded Ginza Line back toward my home in Gaiemmae, I stood half asleep with a knee against my spinner suitcase so that it wouldn’t roll away. Then my forearm bumped someone. I turned to offer the requisite sumimasen (excuse me, sorry) which nearly left my lips. Luckily it didn’t. I had almost apologized to the handle of my suitcase. It has been a while. Longer than I’d hoped. After an eventful weekend in the Japanese countryside followed by jaunts to distant areas of Japan and several hours on trains to write about the adventures, the computer got balky. Photos refused to download from the phone. Photos emailed to computer failed to arrive. The Halloween post which should have been done in less than half an hour took three hours to format. The computer’s speed reminded me of the not so good-old dial-up days. After I connected with my trusty go-to tech for remote support he had the matter figured out in short order. Whew! I had not picked up e-pestilence from a dodgy free WiFi source. I had a faulty router. WiFi connection was was terminating and reconnecting every 30-40 seconds. Monday morning the management company for my building sent over a new router. Tuesday I had two intense classes. Now Wednesday in my part of the world and my day off, dealing with the backlog has begun. More is coming. Soon. What do you dress as when you’ve unexpectedly been invited to a Halloween karaoke party and you don’t want to spend big bucks on a costume? I’d bought a cheap wig in Tokyo but left it behind as it was hot, uncomfortable and shed like crazy. When I bought the wig I had found a little pumpkin hair clip to pin into it; however, my own hair is too fine to hold anything of that kind. I decided to clip it to my clothing and make lame excuses for not dressing up. Then while chatting at lunch about the party with my friend whom I was visiting in Yonezawa I got an idea. In Japan the (separate) room in the house which houses the toilet has its own slippers. You leave yours outside the door and even though you aren’t walking anywhere but more or less turning around to face the door in them, you step into the toire srippa. When you are ready to leave you step back into your own and turn the others ready for the next person to step into. Except that most non-Japanese forget at some point in their stay in Japan. They waltz out into the main living area with the toire srippa still on their feet—a matter for some mild derision. We popped into a local discount store and found the perfect, ghastly pink pair with the word “toilet” printed on them. 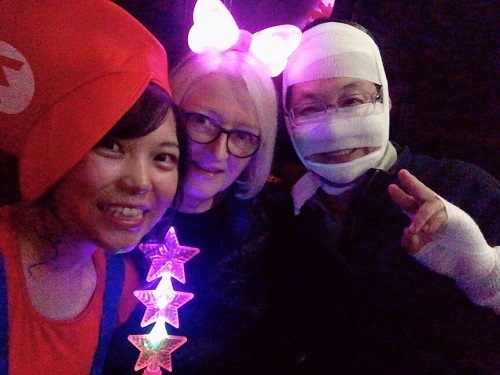 The party was well underway when we got to Oirase, a small, cozy karaoke bar in downtown Yonezawa. The owners had gone all out to decorate the bar for Halloween, and the attendees got into the spirit of the occasion. The culture of cosplay is strong in Japan and my last minute effort was pretty lame compared to that which the others had put into theirs—skillful make-up, coloured contact lenses, wacky accessories. The toilet slippers? Well, everyone (very graciously) thought that was pretty funny. I was given a flashing pink bow to match and we joined the crazy fun.